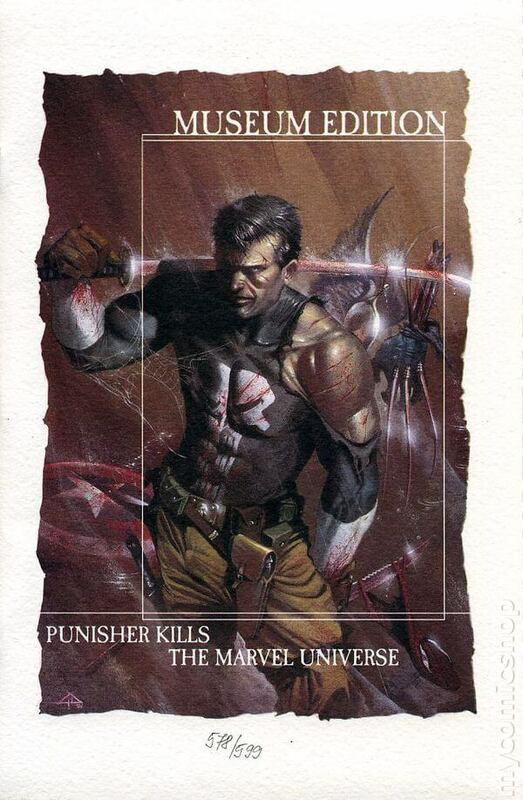 Writer Garth Ennis (his first story for Marvel) lets the Punisher loose on the unsuspecting heroes and villains of the Marvel Universe! THE STORY: In this WHAT IF? style adventure, the wife and children of Frank Castle were killed not in a mob shoot-out, but were instead caught in the crossfire of a super hero slugfest. Contacted by a mysterious group who have also suffered great loss, Castle is given a mission: kill those responsible for the death of his loved ones — the superhumans whose daily battles callously endanger the lives of innocents. Armed with an arsenal of advanced weaponry, the former soldier hunts down Spider-Man, Magneto, Captain America, the Kingpin, Daredevil, Dr. Doom, the Hulk, Venom, Wolverine and more. One by one, group by group, mutant or monster, the one-man army means to kill them all. Pity the heroes… and fear the Punisher!